With the extension of its testing product range to include polymerase chain reaction (PCR)-based systems, Hygiena now covers the entire spectrum of reliable contamination detection, from sample collection to screening of indicator organisms to specific microbial characterisation. These products are suitable for large and small manufacturers of fast-moving consumer goods (FMCG), as well as large corporate laboratories and contract testing facilities serving the food and beverage sector. The all-inclusive product line has been specifically designed to enable the timely detection of quality and safety issues, to give manufacturers the confidence that their quality assurance programs operate to the highest standards. The latest additions of the BAX® System, RiboPrinter® System and Hygiena™ Lateral Flow System follow the acquisition of DuPont Diagnostics (formerly known as Qualicon) and establish Hygiena as a leading provider of targeted solutions, including adenosine triphosphate (ATP), colorimetric, PCR and allergen monitoring systems. 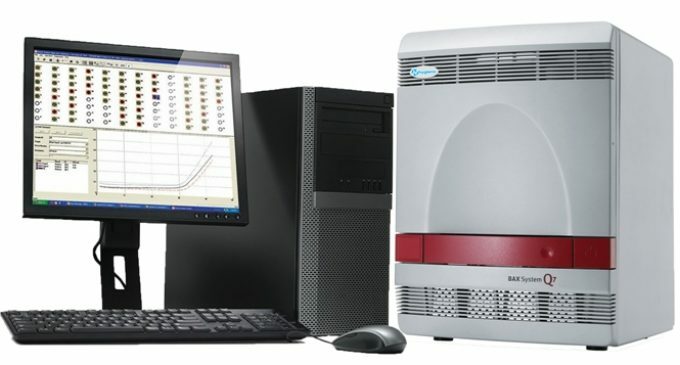 Designed to detect harmful bacteria and other microbes in food and environmental samples, the award-winning BAX® System analyses samples at the genetic level to provide excellent sensitivity, specificity and accuracy. Highly reliable results dramatically decrease false positives, minimise re-testing and optimise speed of time-to-result with minimum hands-on time. With two options available, the BAX® System X5 and BAX® System Q7 meet the food testing needs of different laboratories, from small to high throughput. Hygiena’s RiboPrinter® System provides automated identification of unknown bacterial isolates, characterising them at or below the species level, enabling users to implement highly targeted, effective and efficient safety and quality interventions. Completing the new range, the Hygiena Lateral Flow System uses test strips that combine optimized microbial antibodies and colloidal gold conjugate coated on the surface of a membrane. This approach enables faster pathogen screening results than conventional culture-based testing. Learn more about the new food safety diagnostics product range here.